Rohingya militants attacked police near the end of August, killing 12. But the U.N. has accused Myanmar's military of a "disproportionate" response. The United Nations' top human rights official called out Myanmar on Monday for what he said seemed like "a textbook example of ethnic cleansing." Myanmar is a mostly Buddhist country that denies Rohingya Muslims citizenship. Sources note "widespread hatred" across the country for Rohingya Muslims, though almost all members of the religious minority live in Myanmar's Rakhine State. 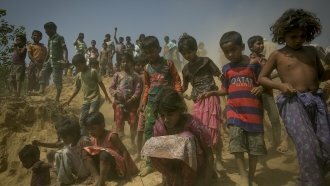 Rakhine has been the scene of violence between Rohingya Muslims and Myanmar's government for decades. Late last month, Rohingya militants attacked police, killing 12. In response to that attack, the U.N. says Myanmar's military has struck back "without regard for basic principles of international law" targeting civilians, not just militants. The U.N. cites satellite imagery that shows security forces burning Rohingya villages and reports of fleeing civilians being shot. More than 270,000 people have fled to nearby Bangladesh in less than a three-week span. And now Myanmar's government has been accused of planting land mines along the border. Myanmar's government has denied "crimes against humanity" claims. But it also hasn't allowed human rights investigators into the country.